Sara Frankl knew she had a terminal disease, but she didn't let it stop her from living. In the face of immeasurable pain, Sara chose joy--again and again. 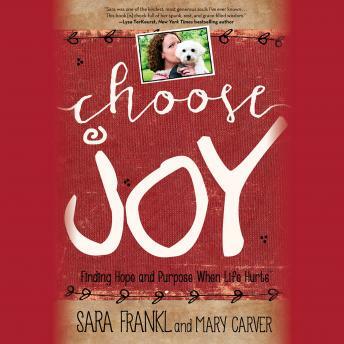 Her unforgettable message of hope and purpose lives on, even after her death, in her words.CHOOSE JOY is a compilation of the lessons Sara learned while she was dying, written in her own words and sewn together by her close friend Mary Carver. It is a reminder to see the beauty in life, even when it looks nothing like you hoped or planned.In a world full of tragedy, choosing joy is no small task--but, as Sara knew, the importance lies in the choosing. Once you learn to make that choice, every day, no matter what happens, joy will come.